I couldn’t understand how these holy women were all okay with it. How did they find spirituality in a room where they sat off to the side? How did they get past the second-class citizenship that Orthodox Judaism imposed on women? How did they not hear the mocking? I listened to the rationales, from my Rabbi, other women, and all of the articles I could find. I noted claims of separation breeding increased focus, and additional space allowing room for meaningful connection. I heard about how women aren’t second-class, but merely set apart, some vowing the female’s higher holiness excused them from certain rituals. I listened and I learned. But I wasn’t convinced. It all sounded good, but as a perpetual student, I knew how easy it is to make an argument for any side, to convince the skeptic with big words and advanced knowledge. 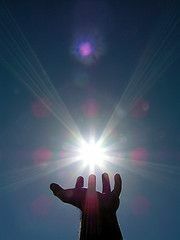 I listened and still I felt its presence, always in my periphery, always reminding me that I was one step below. I missed the Saturday services of my childhood, the little girl braiding her daddy’s tallis to the soundtrack of Hebrew melodies. I missed our family of four, sitting side by side, and the occasional honor of holding my dad’s hand as we stepped up to the bimah for an alliah. I missed the feel of the torah scroll, and the thrill of chanting portions while wrapped in my Israeli tallis. I missed the tradition of shul that I had grown up with. But in truth, all of the things I blamed the mechitza for stealing were illusionary. How many times did we really all sit in shul? The lukewarm services offered little spirituality for my father, and most of my early years, we didn’t attend services at all. My brother and I leaving to play outside or flipping through pages of the Siddur, counting how many left until we could head for the car upon the hint of ‘Adon Olam’, often interrupted the sweet minutes of family. I missed the time together as a family, but it was devoid of holiness, absent of fulfilling prayer. I missed a fictitious memory, and had to admit that I was longing for a storybook ending. Yes, I loved reading from the Torah and leading services gave me a jolt of spirituality unmatched in later years. Yes, I appreciated the equality and ability to stand and be counted. But as for holiness or spirituality? I had no idea what I was missing. We didn’t talk about G-d or discuss personal prayer. We learned Hebrew words with no comprehension for meaning, sang songs for the tunes rather than grateful thanks or prayerful pleas. 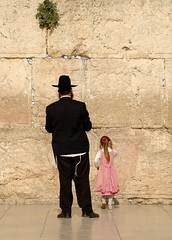 I grew up with Judaism as a culture, filled with traditions and holiday rituals, but lacking in a stirring of the heart. So I learned to make peace with the mechitza. I learned to nod with appreciation at the deepening its offered to my parents, the fulfillment that brims from their eyes in their newly religious lifestyle. I’ve learned to be grateful for the walls of holiness and the tunes of meaning founding within this tiny Orthodox shul, and to count my blessings for the stronger connections we find as a family. I’ve learned to lean against the mechitza, resting in its carved out space to find my own words, and speak from my heart. I’ve learned to sense the caress of distance, and take advantage of the women surrounding me who teach me how to connect. I practice letting go of politics and feministic outrage, leaving academia and ‘being right’ at the doorstep as I kiss the mezuzah and walk into the holy. I let go of figuring it all out, and finding the best rationale for the position of women in shul. I leave equality rants and childish ‘unfair’ cries to others, and instead work on finding what I came for. I seek community, spirituality, guidance, and help. I seek a sense of being heard, and prayers emerged from my soul. I seek a Judaism that is more than rituals and hidden matzo, a Judaism that springs alive and draws me near. It still stands, lines drawn down the middle of the room. 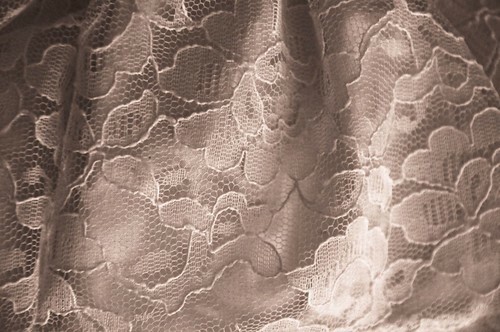 But instead of mocking, I notice the intricate lace patterns and the space it provides for spirituality to rush in.